DETROIT/TOKYO -- Takata Corp. has narrowed a list of bidders to Autoliv and Key Safety Systems for a final round of negotiations, moving the airbag maker a step closer to securing a buyer to steer it through the biggest safety recall crisis in automotive history, said people familiar with the matter. The two bidders gained an edge because both have technical expertise in airbag systems and safety equipment and because automakers view them as able to lower costs and improve the quality of Takata parts, said two of the people, who all asked not to be identified discussing the negotiations. Takata is aiming to find a buyer and finalize its restructuring plan by year-end, the company said this month. The eventual winner faces years of replacing Takata airbags that have been linked to explosions associated with at least 17 deaths and more than 100 injuries. The buyer will potentially be on the hook for recall costs and other liabilities while having to ensure a stable supply of replacement parts to automakers. Regulators have ordered recalls scheduled through at least 2019 that could eventually exceed 100 million airbags used by more than a dozen automakers, including Honda Motor Co., Volkswagen Group and General Motors Co.
Carmakers prefer Autoliv because it's larger and has more resources to handle the recall, one of the people said. Key Safety, which is owned by China's Ningbo Joyson Electronic Corp., makes airbag inflators and has the kind of expertise that could make a deal work. A deal could still lead to Takata seeking some form of bankruptcy protection in the U.S., an option proposed by all bidders, people familiar with the discussions said in October. Chad Tendler, an outside spokesman working for Key safety, and Autoliv spokesman Thomas Jonsson declined to comment. Jared Levy, an outside spokesman for Takata, said he couldn't immediately comment. Antitrust scrutiny may be one potential obstacle to Autoliv because it's already the world's largest airbag maker and would end up with more than half the global market share, according to people with knowledge of the talks. Key Safety is the fourth-largest airbag maker and would jump to No. 2, according to Valient Market Research. For Key Safety, a win could help it earn business from Japanese automakers. 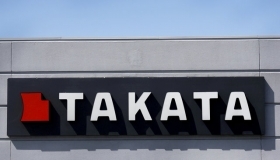 Three other bidders also made it to the most recent round: private equity firm KKR; Bain & Co. and Daicel Corp. of Japan in a joint pitch; and auto-parts supplier Flex-N-Gate Corp. Any of the three could come back if the two finalists do not agree to terms with Takata. Automakers have expressed their preference for a manufacturer with track record of quality control and operations in major markets over buyout firms because of concerns that financial investors will focus on short-term returns over offering a long-term solution to the global airbag supply, people familiar have said. Takata hired Lazard Ltd. as its financial adviser and the law firm Weil, Gotshal & Manges LLP to help weigh options including bankruptcy or a sale. Takata has lost more than 60 percent of its market capitalization since the start of November 2015, dropping its value to about 44.4 billion yen ($399 million). The shares rose 80 yen to 534 yen on Monday in Tokyo. To fund the recalls, Takata has sold all of its holdings in Japanese automakers including Honda and Toyota Motor Corp. It also sold its Irvin Automotive Inc. interiors unit to closely held supplier Piston Group. Of Takata's 718 billion yen in sales during its last fiscal year, 36 percent came from airbags. The company also supplies seat belts, steering wheels, electronics, seat covers, and head and arm rests. The cost of recalling all non-desiccated airbag inflators will be 1.28 trillion yen, Takaki Nakanishi, an analyst for Jefferies Group LLC, said in a report published in May. The death toll is still rising after the first victim from Takata's flawed airbags was killed in 2008. One of the most recent victims is a 50-year-old woman in a Civic compact car, who was killed on Sept. 30 in Riverside County in California. Almost all Takata-related deaths have occurred in Honda-built vehicles with airbags that can rupture and spray shards at vehicle occupants. At the center of Takata's quality crisis is the use of ammonium nitrate as its airbag inflator propellant, a chemical that other inflator makers don't use. The recalls would phase out the use of ammonium nitrate as a propellant.